Easy! 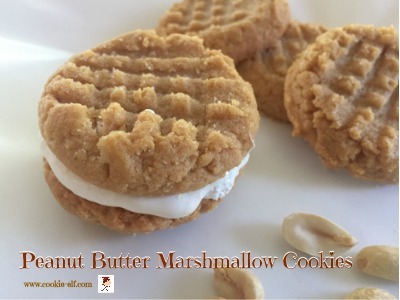 Peanut Butter Marshmallow Cookies: take two peanut butter cookies, slather marshmallow crème on one, and mash them together. It’s the cookie version of the Fluffernutter sandwich, created in the early 1900’s in Massachusetts soon after the invention of marshmallow crème. and originally called the “Liberty Sandwich.” In 1960, an ad agency created the term “Fluffernutter” as a marketing tool. Today the term “Fluffernutter” is attached to all kinds of recipes that combine peanut butter and marshmallow, including cakes, pie, milk shakes, candy bars and even ice cream. Preheat oven to 350º F. Line baking sheets with silicone baking mats. Scoop balls with a 1 ½” cookie scoop and place 2 inches apart on the prepared baking sheets. With a fork, press tines over peanut butter balls in a crosshatch pattern, one at a time, to flatten each cookie. Bake 8-9 minutes until cookies are lightly brown around the edges and appear to have no moisture peeking through crackled tops. Do not over bake. Cookies are best when they are still soft with bottoms that are barely light brown. Remove cookie trays from the oven. Use a dinner knife or angled spatula to spread 2-3 teaspoons marshmallow fluff on the back of one cookie. Press a second cookie on top to make a sandwich. Repeat with the rest of the cookies. Store cookies in an airtight container with waxed paper between layers in the refrigerator. Give cookies plenty of cooling time. They will become more and more firm as they cool. If you remove them from the baking sheets too soon, the cookies may break apart. Let cookies sit on baking sheets until you can safely lift them with a spatula and transfer them to cooling racks without cracking the tops.